A fracture is the medical term for a broken bone. Fractures are common; the average person has two during a lifetime. They occur when the physical force exerted on the bone is stronger than the bone itself. Your risk of fracture depends, in part, on your age. Broken bones are very common in childhood, although children's fractures are generally less complicated than fractures in adults. As you age, your bones become more brittle and you are more likely to suffer fractures from falls that would not occur when you were young. There are many types of fractures, but the main categories are displaced, non-displaced, open, and closed. Displaced and non-displaced fractures refer to the alignment of the fractured bone. 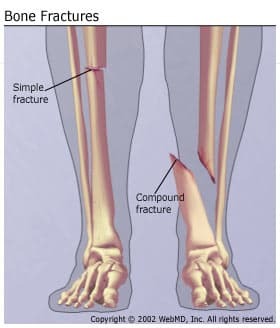 In a displaced fracture, the bone snaps into two or more parts and moves so that the two ends are not lined up straight. If the bone is in many pieces, it is called a comminuted fracture. In a non-displaced fracture, the bone cracks either part or all of the way through, but does move and maintains its proper alignment. A closed fracture is when the bone breaks but there is no puncture or open wound in the skin. An open fracture is one in which the bone breaks through the skin; it may then recede back into the wound and not be visible through the skin. This is an important difference from a closed fracture because with an open fracture there is a risk of a deep bone infection. A buckle fracture results from compression of two bones driven into each other. A transverse fracture is when the fracture line is perpendicular to the shaft (long part) of the bone. The severity of a fracture depends upon the fracture subtype and location. Serious fractures can have dangerous complications if not treated promptly; possible complications include damage to blood vessels or nerves and infection of the bone (osteomyelitis) or surrounding tissue. Recuperation time varies depending on the age and health of the patient and the type of fracture. A minor fracture in a child may heal within a few weeks; a serious fracture in an older person may take months to heal. American Academy of Orthopaedic Surgeons: "Fractures." National Institute on Aging: "Falls and Fractures." University of Iowa Hospitals & Clincs: "Fracture types." Should Your Bones be Tested?